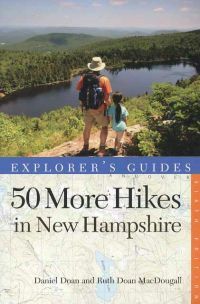 50 More Hikes in New Hampshire, by Daniel Doan and Ruth Doan MacDougall. 6th Edition, 2014. This new edition features full color photos and topographic trail maps. It describes 30 hikes in the Whites, plus 20 in central and southern NH. Like its companion volume, this guide has been thoroughly updated by Dan Doan’s daughter, the novelist Ruth Doan MacDougall. This edition has several new hikes. 264 pp, 6” x 9”.